On first inspection, I was expecting this to be simply "Chavs Vs Aliens" but in fact it was so much better than I thought it would be. Although we learn from the special features that this is a very low budget affair, that really doesn't come across while you are watching it. Attack the Block is written and directed by Joe Cornish (half of TV's Adam And Joe) and stars unknowns John Boyega and Alex Esmail, who totally steal the show. It also features Nick Frost (Hot Fuzz, Sean of the Dead) and Jodie Whittaker (St. Trinians, Venus) and various other young newcomers, all of whom put in sterling performances. 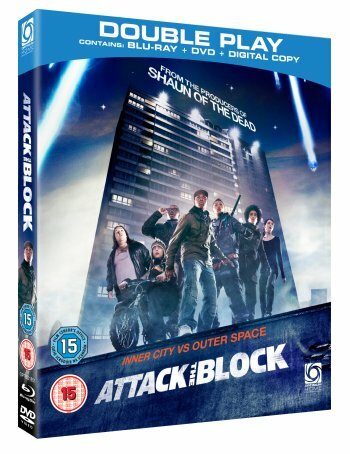 The story is based around one basic premise, Aliens invade Earth and one small group of youngsters in a tower block try to save their home. Simple but beautifully written and executed, with just the right blend of action and comedy. There are also quite a few scary moments and the Aliens are actually quite frightening, they definitely feel 'wrong' and make you slightly uneasy. In summary this is an excellent film, well worth buying and one that will certainly be watched over and over again.